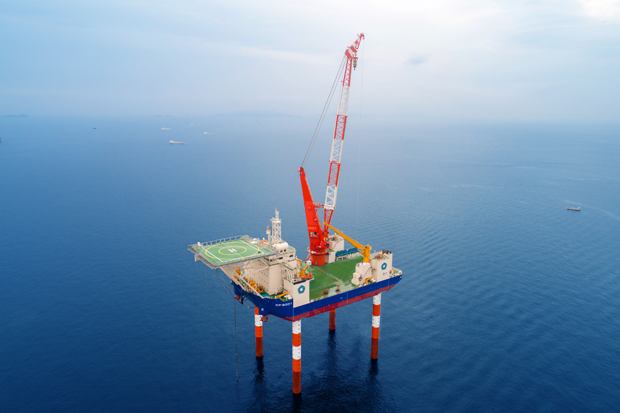 Tokyo, Japan - January 16, 2019 - Penta-Ocean Construction Co., Ltd. is pleased to announce the completion of construction of CP-8001, the first Japanese multipurpose self-elevating platform equipped with a fully-revolving crane. The Dutch specialist GustoMSC supervised the basic design and Japan Marine United Corporation undertook the construction. After delivery on December 10, 2018, the vessel went through various sea trials in Japanese coastal waters in preparation for the upcoming offshore wind turbine installations and other marine works. The Port of Kitakyushu is now designated as her home port. The enactment of relevant regulations*1 which advocate installation area expansion from nearby shores into deeper waters will undoubtedly provide further potential for offshore wind farm projects. CP-8001’s highly efficient and accurate features will allow operation even in sea areas with severe weather and marine conditions, making her most suitable for installation works of offshore wind turbines and other marine works. The large crane demonstrates a high level of stability, efficiency and reliability, even in sea areas with harsh weather and marine conditions. Designed to perform installation of large-scale marine structures such as 10 MW wind turbines. Equipped with a state-of-the-art continuous hydraulic jacking system developed by GustoMSC. Operational in depths up to 30m (50m when equipped with longer legs). Carries adequate accommodation space and a helicopter deck for emergency human transport. Maximizes productivity in marine works by efficient execution of transport and installation when employed simultaneously with CP-5001, our self-propelled multipurpose vessel with a large crane. © Copyright PENTA-OCEAN CONSTRUCTION CO., LTD. All Rights Reserved.